Hello everybody! It's Friday again, and therefore time for a new release. We are sorry to bother you for the third consecutive week in a row with a new release, but lately we've been somewhat unlucky concerning the releases. While in 1.2.1 we broke the Writing Targets, in 1.2.2 we broke the functionality to create new directories. 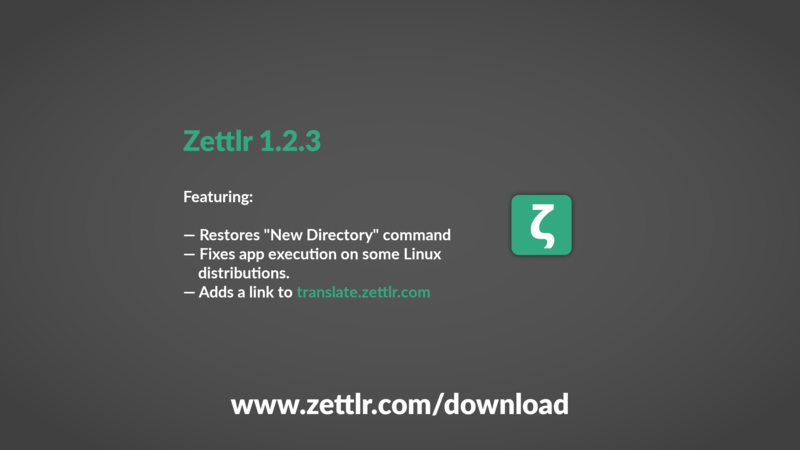 Additionally, the latest Electron-version, on which Zettlr is built, introduced a bug in 1.2.2 that made it impossible to run Zettlr on some Linux systems without applying a certain patch prior to executing it. This version fixes both of them and promises to be the last release in the 1.2.x-line of Zettlr applications. If nothing goes wrong, the next version will be 1.3.0 and it will include new features, again. Oh, and, additionally, we've added a link to download new translations for the app from our translation provider at https://translate.zettlr.com/ in the preferences so that these may be found easier!